Ever eaten the inky cap mushroom? If you’re chewing some right now, that’s fine. Just don’t drink for a while. This mushroom doesn't harm sober people, but it brings down the wrath of god on drinkers. Inky cap mushrooms are rather pretty things that grow well in places occupied by humans. They take to lawns, pastures, and abandoned lots — anywhere the soil is disturbed regularly. They come out of the ground as oblong, chalky-white bells which then spread out to look like umbrellas. The gills on the underside turn a striking black, slowly graying the upper half of the mushroom. Inky caps look tasty, and plenty of people must be tempted to have a bite. For the most part, a bite is fine. Although inky caps are not food mushrooms, and shouldn’t be made into a big meal or eaten long-term, generally a single mushroom won’t do you any harm. Except that inky caps are also called tippler’s bane. They take a rather puritanical view of drink. People who drink anywhere from three hours to five days after eating an inky cap will feel their face start getting red, their limbs tingle, and their heart start to race. Then comes the nausea, vomiting, and in severe cases, heart problems. The more alcohol the unfortunate sinner drinks, the more they’ll suffer. If things get bad enough they’ll have a heart attack. One person has died from eating an inky cap and then drinking. Inky caps wreak their vengeance by starting up an immediate and severe hangover. The chemical acetaldehyde is generally associated with hangovers, and experts believe that it causes the sweating, nausea, and vomiting that so many people lament. Eventually, though, enzymes in the body break down the acetaldehyde and people recover. 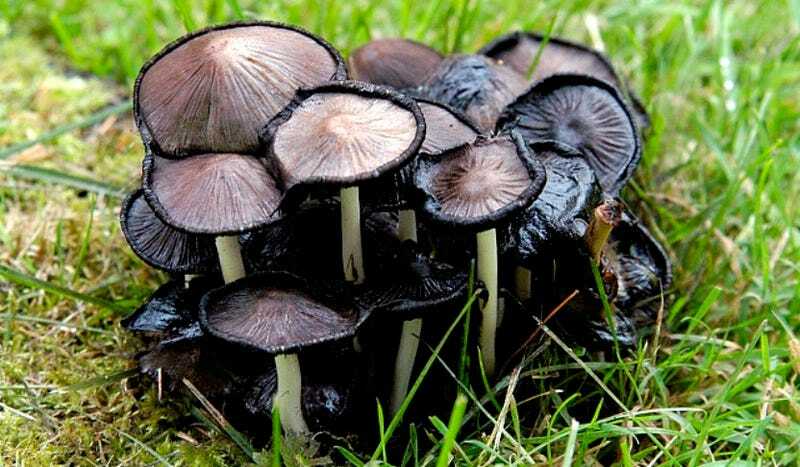 Inky caps, however, contain coprine, a chemical which halts the enzyme — resulting in an immediate build-up of acetaldehyde, and no end to the hangover. It can take days to work the coprine out of a person's system. Coprine was studied extensively by scientists who wanted to use it to make alcoholics averse to drinking. But its methods, and its long term effects, were found to be too severe. Inky caps have no such scruples, so beware these mushrooms if you aim to have a drink. Via Everdeen State College and Steve Brill.